To bathe or not to bathe your ferret; that is the question. There is a lot of confusion about this topic amongst the ferret community. Some of the reason for this is misinformation given by pet stores and websites. Plus, as humans, we are taught to wash frequently to stay healthy and clean, so it makes sense that we make the incorrect assumption that animals need to do the same. However, the opposite is true in the case of the ferret. According to Katherine Quesenberry and James W. Carpenter in their book Ferrets, Rabbits, and Rodents: Clinical Medicine and Surgery, frequent bathing of ferrets can strip the oils produced in the skin’s sebaceous glands, leading to severe dryness and itchiness. In Kim Schilling’s Ferrets for Dummies, it’s noted that when oils are stripped during a bath, the sebaceous glands may overcorrect, creating even more oil and causing the ferret to smell muskier. Ferrets, like cats, clean themselves and therefore do not need frequent bathing by a human. They groom themselves every day, ensuring that the oils in their skin are evenly distributed and their skin and fur are free of dirt and other contaminants. 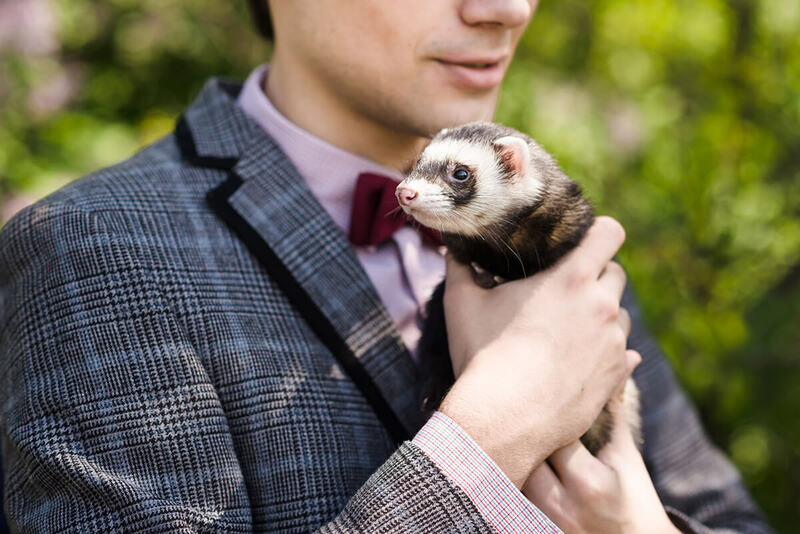 This means that ferrets need extremely infrequent baths, usually only when the ferret gets into mud or something else very messy, the ferret needs a flea or other parasite treatment, or your vet recommends it (e.g. if the ferret has a condition that causes them to produce too many skin oils). If possible, it’s better to spot clean your ferret, like if they get blackheads on their tail or get into a smaller mess. Feed a healthy diet. Ferrets need a diet that is high in fat and animal protein and low in carbohydrates and fiber. If dietary requirements are not me,t the coat quality can become dry and dull. Wash bedding frequently. The more ferrets you have, the more you will need to wash their blankets. As a rule of thumb, I recommend changing a ferrets blankets once a week. This removes the excess oils from their environment, keeps the cage hygienic, and reduces the smell. Also, make sure you are using a natural detergent that has no added fragrances, as ferrets can be very sensitive to these. Don’t bathe your ferret. 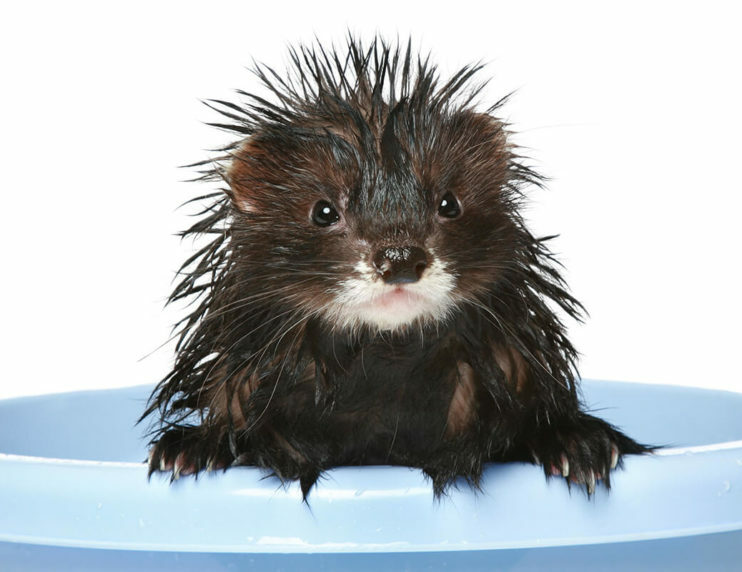 Bathing only strips a ferret’s natural layer of oil from their skin and coat and can result in a flaky, itchy, and dry skin condition. Change their litter every day. The majority of the smell that comes from your ferret’s cage will come from its litter box. Because ferrets are fastidious animals by nature, they prefer to poop in a clean litter box. If a litterbox is left dirty, they will find other corners in the cage to poop and pee in, which will make the smell worse. Spay or neuter your ferret if you don’t plan to breed. The sebaceous glands in intact ferrets have been found to be larger than those in neutered ferrets. 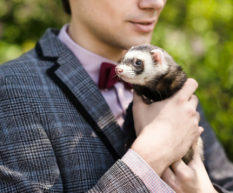 Furthermore, hormonal changes during breeding season cause profuse oil secretions, leading to an oily and smelly coat, particularly in male ferrets. Make sure the environment is humid enough. In order for a ferret’s coat to remain healthy, they need a good amount of humidity in the air. The winter can be the worst, with the drier air and the heat cranked up. Get a humidifier for your ferret if their skin and coat become dry. Use paper litter. Some clay litters have been found to dry out your ferret’s coat. I recommend using recycled paper pellets.